Veteran Indian activist Anna Hazare, posing after a meeting in Noida on August 2. New Delhi (CNN) -- A veteran anti-corruption activist has been freed, hours after he and seven supporters were sent to jail for seven days by a court in New Delhi, a prison official said Tuesday. The court had sent 72-year-old Anna Hazare and his supporters to jail because they would not sign bail bonds, said Rajan Bhagat, a police spokesman in New Delhi. 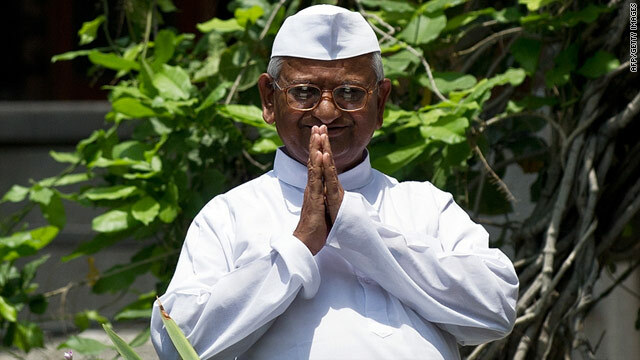 Hazare had been detained in advance of a hunger strike, for which investigators said he lacked the official permission. They also briefly detained 1,300 supporters who planned to join him at a protest site where he was to have begun his demonstration, Bhagat said. But jail spokesman Sunil Gupta told CNN Hazare and the other seven activists had been shifted to the prison headquarters within hours of being sent to jail. The campaigners, however, have refused to leave the prison office until their request to be allowed to hold their hunger strike without conditions unacceptable to them is met, Gupta said. "We are conveying their demands to authorities," he said. The release orders were issued by the same magistrate who remanded the eight activists into jail earlier in the day, Bhagat said. Hazare's arrest triggered street demonstrations, television footage showed. Protesters waving Indian flags were seen raising pro-Hazare slogans. Hazare conducted a five-day hunger strike in April at New Delhi's Jantar Mantar landmark, ending it only after India's prime minister agreed to introduce long-pending legislation meant to crack down on graft. Anti-corruption campaigners have rejected legislation prepared by the federal government to create a citizen ombudsman, saying the bill, now in Parliament, was too weak to tackle endemic graft in the system. Led by Hazare, they have been demanding a stronger institution that they say should be capable of tackling corruption Indians encounter in their daily lives. Critics, on their part, have accused the campaigners of challenging the authority of elected legislature that has to debate and decide the proposed law. In his remarks Monday, Prime Minister Manmohan Singh disapproved of hunger strikes as a means to push demands. Singh, whose government is roiled in massive corruption scandals, acknowledged in his national address to mark India's Independence Day that no single measure could handle chronic corruption. "I believe that there is no single big step which we can take to eradicate corruption. In fact, we will have to act simultaneously on many fronts," Singh said. Meanwhile, Indian Home Minister P. Chidambaram told reporters that campaigners' insistence on not accepting legislation other than their own version of the anti-corruption bill was "beyond comprehension." "How can you indirectly endorse such an argument that it his, his bill and no other bill (which is acceptable)?" Chidambaram asked. The home minister insisted police took Hazare into custody after the veteran activist told officers that he would "defy" orders not to hold a demonstration until he agreed to laid-out conditions. He said Hazare and his supporters were welcome to raise their concerns with a parliamentary committee that will scrutinize the citizen ombudsman legislation before it is presented to lawmakers for a vote. As a mark of protest, activists called upon government employees to take a day's leave in a show of solidarity with Hazare, a call the federal administration was quick to term "wrong." "I sincerely hope that the government servants don't respond to such wrong calls," Chidambaram said.